Used Abarth models have depreciated just as badly as all other Italian cars. This example with 9,281 miles is now $15,500. I haven't been able to find any Fiesta ST's for under $20k. I haven't driven the Abarth or the FiST, so I really have no opinions on which is best. Based on the reviews and hype I've seen around the two, I would choose the Fiesta ST. 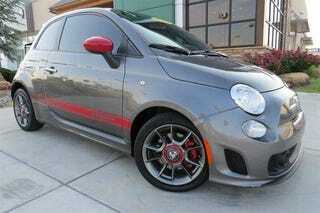 However, cash rules everything around me, so I can't ignore that $5000 or more I might save buying an Abarth. The real question is whether or not it'll keep depreciating. So Oppo, let's put our practical pants on and talk about money. Is the FiST $5,000 better than the Abarth? Which will depreciate worse? Will Ben Affleck as Batman be terrible? That and more will be answered sometime, but not today.